New in 3.2: Added option to auto deploy on save for Portal artefacts. Added specification of MIME Type and Display Order for Portal web files. 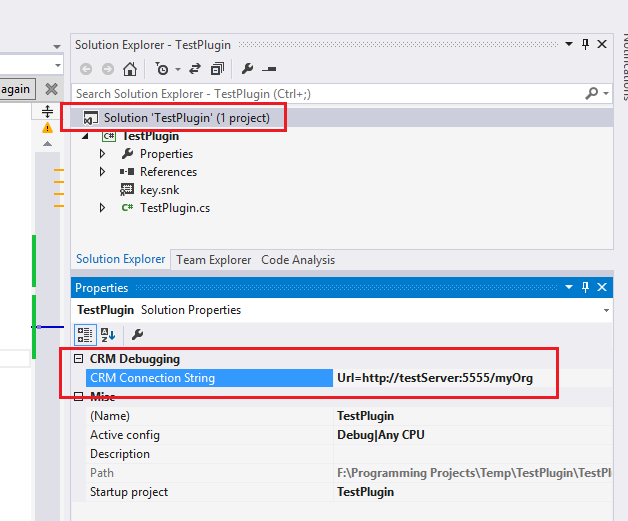 New in 2.5: Tighter integration with CRM Developer Toolkit projects. New shortcut key to deploy web resource in current code editor. I have released a new Visual Studio extension that aims to quicken the dev/debug cycles for CRM developers. This extension allows you to quickly deploy web resources and assembly changes to CRM, and also to attach the debugger to the Async Service, IIS or the Sandbox Worker process using keyboard shortcuts. Regarding assembly deployment, the intention is to only deploy binary changes. The tool therefore does not deal with assembly or plugin step registration in CRM. To use the deploy assembly commands, you would need to first register the assembly with CRM using other tools (e.g. the Plugin Registration tool). Below is a description of the actions performed by each of the command. Note that most of the commands below require you to run Visual Studio under an account with local administrator permissions. This command only deploys the project’s main output, i.e. single assembly. All other files are ignored. This command looks for files under a folder named WebResources and connect to CRM (using the specified connection string) to upload them as web resources. The name of the web resource in CRM is determined by the folder structure of the file within the project. Below are some examples of how the CRM name will be determined. If the file is located at WebResources\bnh_scripts\account.js – the CRM name will be bnh_scripts/account.js. Note that CRM requires the name to have a prefix so ensure that you include this in the folder names (for nested files) or file names (for files directly under the WebResources folder). The web resource type is determined base on the file extension. Files with unrecognised extensions are ignored. Web resources are created if they do not already exist in CRM, otherwise they are updated. Please note that to debug Sandbox plugins, you will need to make a change in the Registry to disable the shutdown of the Sandbox Worker process as detailed here: https://msdn.microsoft.com/en-us/library/gg328574.aspx#bkmk_sandboxplugin. Deploy Assembly to CRM Database – the assembly will be updated in the CRM database, but the debug file will not be copied to the CRM’s Bin folder. You can download the extension from Visual Studio Gallery using this link.